“Life insurance ranks at the top of the list of things consumers know they probably should buy, but get no personal enjoyment from whatsoever. There’s just no happy way to look at life insurance. But while life insurance isn’t all that much fun to buy, much less talk about, it’s a critical part of many people’s financial plans. A life insurance policy is a pact between you and the insurance company. As long as you pay the bill, or premium, the company will be there to pay a death benefit to your beneficiaries if you pass away, giving them cash to get by. Raising children, earning money every day, making plans for the future, buying a home are all dependent on you being around. Funding your plans for the family in the event of an untimely death is the main purpose of buying life insurance. 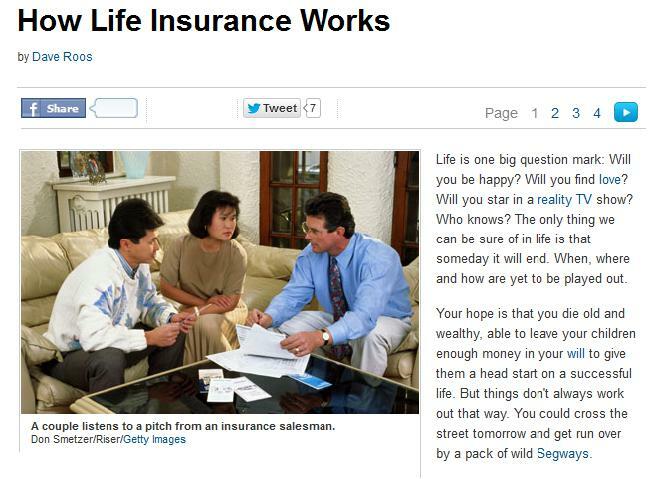 Dave Roos of HowStuffWorks.com explains the importance of buying life insurance. Once you have determined that you need or want insurance the first step is researching rates and products. This is very easy, be sure to find a life insurance brokers in Toronto that has a website capable of giving you information on the various products available as well as quotes. It is important to deal with an insurance broker that offers products from a wide variety of top tier life insurance companies so that you get the best price for your age and lifestyle. The cost of life insurance primarily depends on its type, either term life or whole life. By its name, term life insurance means it covers a temporary or specific period, typically 10, 20 or 30 years, the premiums are fixed for that entire term. As a result, term life insurance premiums are more affordable than whole life (permanent insurance). Meanwhile, whole life insurance plans are designed to be with you for your entire life. Premiums start off much higher than term insurance but remain level for your entire life. Unlike term insurance you can count on this money as being a part of your estate. You will die someday and when you do, your beneficiaries (your children, spouse or favourite charity) will get these funds. The cost of life insurance and options between the various life insurance companies can be quite different. Certain companies have better rates for smokers; others have better rates for pilots or people involved in scuba diving or other extreme sports. Still others are more forgiving of high blood pressure and diabetes. Some give preferred rates more readily or often for healthy individuals. Some have a higher incident of declining people they feel present a risk too great to insure. Each insurance company decides what they will charge for each age and condition. For this reason consider asking a knowledgeable Toronto life insurance broker like Insurance Advantage to help you compare rates and choose the best type of insurance for your specific situation. According to Michael Babad of The Globe and Mail, many Canadians are now burdened with a huge mortgage debt, which contributed to the increase in household debt per capita for the second quarter of 2013. Before It’s Too Late: Why Consult Toronto Life Insurance Brokers? Toronto, Ontario (December 16, 2013) – Insurance Advantage is offering life insurance on your mortgage for people who want to make sure they leave no debt behind. With this type of policy, an outstanding mortgage can be completely paid off in the event that the insured passes away.